Last minute bookings for Training! Book Now! Adult Level 2, Children's Stage 3 Courses, 29 th April, 1 st & 6 th May Places are still available on these 2 courses. Website bookings are open until Wednesday 26 th April. After this date, please contact training@ripon-sc.org.uk to find out whether there are any remaining places. This Easter Sunday we have the usual Spring morning and afternoon series races with the added bonus of on the day Easter egg prizes. Best 3 out of 4 races to count with the first race at 11:00am. So if you want to get into the chocolates - Literally! then come along and join in the racing. FISH AND CHIPS, AND RACE HUT TIPS! Over 20 members of the club attended an RO familiarisation course held on 11 April. With a Fish and Chip supper kicking the evening off, Bernard and Jennie took the attendees through the paperwork, flags, clocks and (very loud when it's in the clubhouse) auto hoot system and how they are used for club racing. Discussions included setting good start lines and how to set a course which doesn't result in carnage. 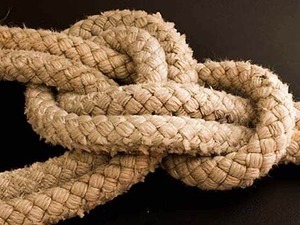 How well do you know your knots?